My kids are big fans of any food that they can hold in their hands and dip into a yummy sauce. I came across this recipe a couple of years ago and it has been a family staple since! Sometimes the “baked” version of fatty fried foods does not ever taste as good, but these are definitely the exception. You won’t even notice that they aren’t fried- the tortilla bakes up perfectly crispy. You will probably want to make a double batch of these because I promise your family will love them! Line a baking sheet with foil and lightly coat with cooking spray. Heat cream cheese in the microwave for about 20-30 seconds so that it is soft and easy to stir. Add green salsa, lime juice, cumin, chili powder, onion powder and garlic powder. Stir to combine. Then add cilantro and green onions. Add chicken and Pepper Jack cheese and combine well. I'm gonna need to try these. They looks sooooooooo delicious!!! 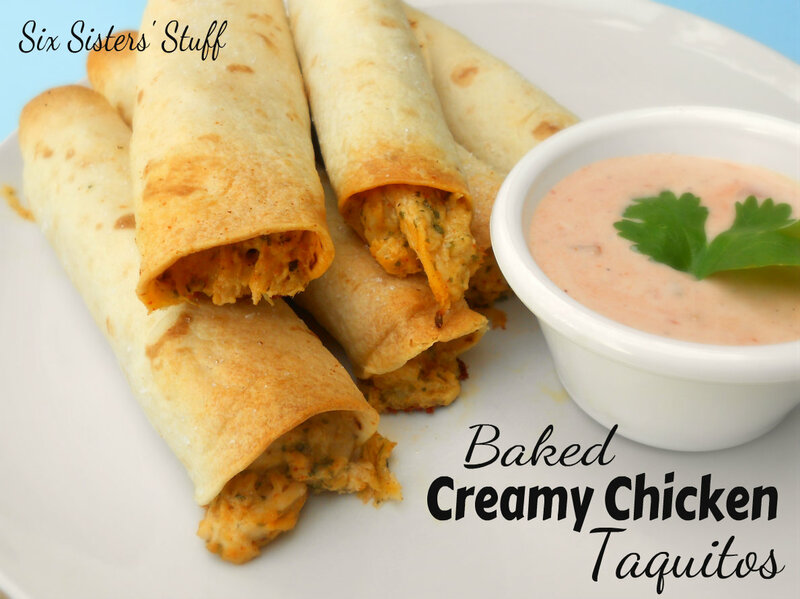 We love to dip these in Ranch dressing or Cilantro Ranch Dressing. Here is the recipe for Cilantro Ranch Dressing. You can find it here also - https://www.sixsistersstuff.com/recipe/2016/09/cafe-rio-steak-salad/ Cilantro Ranch Dressing: Ingredients: 1 packet TRADITIONAL Hidden Valley Ranch mix (not BUTTERMILK) 1 cup mayonnaise 1 cup buttermilk 2 tomatillos, husk removed and diced 1/2 bunch of fresh cilantro 1 teaspoon minced garlic juice of 1 lime 1 jalapeño (more or less depending on how hot you like it) Instructions: Mix all ingredients together in a blender. As soon as I see a recipe with the word "creamy" I am sold! Cannot wait to try! Can you freeze this recipe? If so, would you cook it before freezing or after? I think that these would be awesome to freeze! And I think that you could do either- cook them before and then just reheat them, or assemble them, freeze them, and then cook them. I think that either way would work perfectly! Camille, I swear we went to school together. If you don't mind me asking where you are from and where you went to High School. I am think we actually went to elementary school together. Did you go to Sara Jane Adams in Layton? Maybe I am crazy but I know that I know you from somewhere. Hi Aubriona! We totally went to school together! Hee hee! Gotta love Adams Elementary! And if I remember correctly, didn't you go to USU also? So your aunt Ann is my mom's best friend and we always hung out with the Flint boys when we were growing up (we always went to Bear Lake together each summer). Such a small world! I am glad that you said something! Hope you are doing well! I made these for supper last night.....they were delicious! Definitely making a double batch next time! Warming some up for lunch right now. Yumm!! I Can't wait to try these!! Yum, nothing better than homemade taquitos!! Well, at least, our family thinks so! Thanks for sharing at Foodtastic Friday. Thanks so much for linking up to Talent Tuesday! You're this week's feature! This looks so yummy, I will most definitely have to try this soon! Hi..I was wondering if I could make these vegetarian...and just use beans and cheese instead of chicken...if so, would the instructions and cooking time be the same? thank you! For the original recipe, the chicken was already cooked. It mainly needs to heat through and you want the tortilla to get browned and just barely crispy on the edges. It should be close to the same amount of cooking time. Just watch them closely. Is there a recipe for your sauce to dip the Taquitos? Always love a great dipping sauce.